Tour the recently uncovered Mayan ruins of Ek Balam, and enjoy a variety of activities while cooling off at beautiful Cenote Maya, a brand-new off-the-beaten track adventure combo from Playa del Carmen Tours! We will start off with a guided tour of Ek Balam, an ancient Mayan city that thrived about 1500 years ago. It is amazing how well preserved these ruins are. Unlike popular ruins sites like Chichen Itza and Tulum, you can still climb the great Acropolis pyramid at Ek Balam, for dramatic views of the Riviera Maya. Ek Balam is much less visited than its fellow ruins sites and the less crowded environment is a perfect introduction to the legends and history of the Mayan empire. After the guided tour, you'll have time to explore on your own and take photographs. 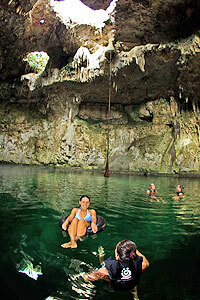 The next stop is nearby Cenote Maya, where you'll descend under the ground to a hidden freshwater pool. Here you can rappel into the cenote (there are stairs for the less adventurous) and zip line or swing on Tarzan's vine into the refreshing waters. We'll enjoy real Mayan delicacies at the local restaurant, and you can also watch the local artesans create authentic Mayan handicrafts, explore the gardens or relax in hammocks. When: Mondays, Wednesdays, Fridays and Sundays from 7:30 AM to 5:30 PM. Exact pick-up time depends on the location of your hotel, but will be shown on your confirmation. Prices shown reflect the full 45+ days advanced booking discount - see promo details below. BOOKING 45+ DAYS IN ADVANCE! *Limited Time Offer: Special discount price valid only for reservations made in 2018 for any tour date. This offer requires 8-29 days advance reservations to get A 10% discount, 30 - 44 days advance reservations to get a 15% discount and 45 days or more advance reservations to get the full 20% discount. Reservations made less than a week in advance pay regular price. Cruise Passengers: Sorry, but this tour is not compatible with most cruise ship schedules. We suggest to consider a tour to Tulum or Coba instead due to time constraints.